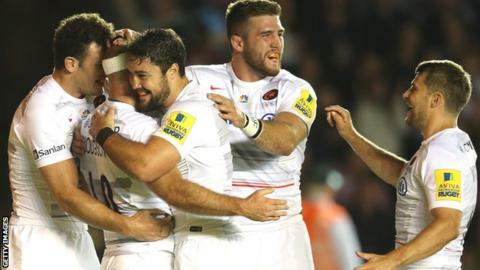 Charlie Hodgson scored 22 points as Saracens thumped Harlequins. Saracens' outside-half scored the only try of a one-sided first-half, converting his own score, as well as later sending over five penalties. Hodgson was sin-binned along with Alistair Hargreaves after the restart, while Alex Goode also contributed with a penalty for Sarries. Chris Ashton and Will Fraser crossed late on as Owen Farrell converted both to complete the humiliation. This was a repeat of last season's Premiership semi-final and while that affair was close, Friday night's meeting was anything but. Sarries, who like their opponents won their opening fixture of the new season at Twickenham last weekend, led this encounter 16-0 at the break. Harlequins director of rugby Conor O'Shea: "The players went over to the crowd to apologise afterwards because that's not us." The hosts were their own worst enemy, as two penalties from Hodgson were followed by a converted try from the former England fly-half. He crossed following a charge-down of opposite number Nick Evans' laboured kick on the 40-metre line, before running unchallenged to go over under the posts. Hodgson made it 16-0 with his third penalty of the night, with the Sarries juggernaut threatening to run away with the game. Quins had chances to make an impression on the scoreboard but sent one penalty wide, while wasting two further opportunities after kicking to the corner and failing to make the most of the territory - it would be a common theme throughout this game. Sarries had Hodgson sent to the sin bin but Quins replacement Ben Botica could only strike the upright with his penalty. With Hodgson off the pitch, Goode sent over their fourth penalty for 19-0 as the scoreboard continued to make grim reading for the home fans. Saracens director of rugby Mark McCall: "We felt last weekend we were lacklustre and lacked energy. I thought we were pretty relentless tonight." Chances continued to come and go for Quins with the Saracens pack keeping out everything thrown at them, while being particularly impressive at the breakdown. However, a further infringement saw captain Hargreaves yellow carded and again Quins had a numerical advantage. They failed to take advantage though and, despite several further penalties during a dominant period, they could still not cross. Hodgson returned to the field in time to make it 22-0, before the rout began as he sent over a further penalty. Worse was to come with Ashton's try following a hopeful punt upfield and Farrell's conversion pushed the score up to 32-0. Late on, Fraser bundled over following a line-out drive and Farrell completed the scoring on a grim night for the Quins. "The players went over to the crowd to apologise afterwards because that's not us. "We'll find that very difficult to take, but we have to take it. It's an incredible emotional low. We didn't see it coming. "We won't read the players the riot act for something like that. It's sport and sometimes you come across things you can't explain. "I'll give all credit to Saracens, they were outstanding." "We felt last weekend we were lacklustre and lacked energy. I thought we were pretty relentless tonight. "The pack gave Charlie a great platform and he pulled the strings wonderfully. He was one of many top performers out there. Across the board they were great. "From our point of view this was just another game against an opponent we regard very highly. "We didn't expect that scoreline. We had the energy we missed last weekend." Harlequins: Brown, Yarde, Hopper, Turner-Hall, Lindsay-Hague, Evans, Care, Marler, Gray, Sinckler, Matthews, Robson, Wallace, Robshaw, Easter. Replacements: Botica for Evans (41), Dickson for Care (63), Buchanan for Gray (59), Collier for Sinckler (59), Merrick for Matthews (61). Not Used: Lambert, Clifford, Walker. Replacements: Buchanan, Lambert, Collier, Merrick, Clifford, Dickson, Botica, Walker. Saracens: Goode, Ashton, Taylor, Barritt, Strettle, Hodgson, Wigglesworth, Barrington, George, Longbottom, Kruis, Hargreaves, Wray, Fraser, B. Vunipola. Replacements: Wyles for Strettle (63), Farrell for Hodgson (66), Spencer for Wigglesworth (73), Gill for Barrington (51), Spurling for George (79), Du Plessis for Longbottom (54), Botha for Hargreaves (66), Brown for Wray (51). Sin Bin: Hodgson (43), Hargreaves (55).